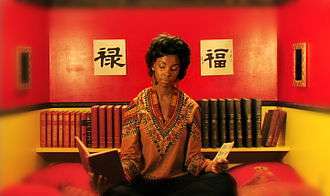 In this thought experiment, a person in the "Chinese room" is passed questions from outside the room, and consults a library of books to formulate an answer. The Chinese room argument holds that a program cannot give a computer a "mind", "understanding" or "consciousness",[lower-alpha 1] regardless of how intelligently or human-like the program may make the computer behave. The argument was first presented by philosopher John Searle in his paper, "Minds, Brains, and Programs", published in Behavioral and Brain Sciences in 1980. It has been widely discussed in the years since. The centerpiece of the argument is a thought experiment known as the Chinese room. Gottfried Leibniz made a similar argument in 1714 against mechanism (the position that the mind is a machine and nothing more). Leibniz used the thought experiment of expanding the brain until it was the size of a mill. Leibniz found it difficult to imagine that a "mind" capable of "perception" could be constructed using only mechanical processes. [lower-alpha 5] In 1974, Lawrence Davis imagined duplicating the brain using telephone lines and offices staffed by people, and in 1978 Ned Block envisioned the entire population of China involved in such a brain simulation. This thought experiment is called the China brain, also the "Chinese Nation" or the "Chinese Gym". Most of the discussion consists of attempts to refute it. "The overwhelming majority," notes BBS editor Stevan Harnad,[lower-alpha 6] "still think that the Chinese Room Argument is dead wrong." The sheer volume of the literature that has grown up around it inspired Pat Hayes to comment that the field of cognitive science ought to be redefined as "the ongoing research program of showing Searle's Chinese Room Argument to be false". Searle's argument has become "something of a classic in cognitive science," according to Harnad. Varol Akman agrees, and has described the original paper as "an exemplar of philosophical clarity and purity". The position is implicit in some of the statements of early AI researchers and analysts. For example, in 1955, AI founder Herbert A. Simon declared that "there are now in the world machines that think, that learn and create"[lower-alpha 8] and claimed that they had "solved the venerable mind–body problem, explaining how a system composed of matter can have the properties of mind." John Haugeland wrote that "AI wants only the genuine article: machines with minds, in the full and literal sense. This is not science fiction, but real science, based on a theoretical conception as deep as it is daring: namely, we are, at root, computers ourselves." Stevan Harnad argues that Searle's depictions of strong AI can be reformulated as "recognizable tenets of computationalism, a position (unlike "strong AI") that is actually held by many thinkers, and hence one worth refuting." Computationalism[lower-alpha 11] is the position in the philosophy of mind which argues that the mind can be accurately described as an information-processing system. Biological naturalism implies that one cannot determine if the experience of consciousness is occurring merely by examining how a system functions, because the specific machinery of the brain is essential. Thus, biological naturalism is directly opposed to both behaviorism and functionalism (including "computer functionalism" or "strong AI"). Biological naturalism is similar to identity theory (the position that mental states are "identical to" or "composed of" neurological events), however, Searle has specific technical objections to identity theory. [lower-alpha 13] Searle's biological naturalism and strong AI are both opposed to Cartesian dualism, the classical idea that the brain and mind are made of different "substances". Indeed, Searle accuses strong AI of dualism, writing that "strong AI only makes sense given the dualistic assumption that, where the mind is concerned, the brain doesn't matter." Colin McGinn argues that the Chinese room provides strong evidence that the hard problem of consciousness is fundamentally insoluble. The argument, to be clear, is not about whether a machine can be conscious, but about whether it (or anything else for that matter) can be shown to be conscious. It is plain that any other method of probing the occupant of a Chinese room has the same difficulties in principle as exchanging questions and answers in Chinese. It is simply not possible to divine whether a conscious agency inhabits the room or some clever simulation. 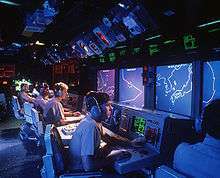 Patrick Hew used the Chinese Room argument to deduce requirements from military command and control systems if they are to preserve a commander's moral agency. He drew an analogy between a commander in their command center and the person in the Chinese Room, and analyzed it under a reading of Aristotle’s notions of 'compulsory' and 'ignorance'. Information could be 'down converted' from meaning to symbols, and manipulated symbolically, but moral agency could be undermined if there was inadequate 'up conversion' into meaning. Hew cited examples from the Vincennes Incident. Searle does not disagree that AI research can create machines that are capable of highly intelligent behavior. The Chinese room argument leaves open the possibility that a digital machine could be built that acts more intelligently than a person, but does not have a mind or intentionality in the same way that brains do. Indeed, Searle writes that "the Chinese room argument ... assumes complete success on the part of artificial intelligence in simulating human cognition." The Chinese room has a design analogous to that of a modern computer. It has a Von Neumann architecture, which consists of a program (the book of instructions), some memory (the papers and file cabinets), a CPU which follows the instructions (the man), and a means to write symbols in memory (the pencil and eraser). A machine with this design is known in theoretical computer science as "Turing complete", because it has the necessary machinery to carry out any computation that a Turing machine can do, and therefore it is capable of doing a step-by-step simulation of any other digital machine, given enough memory and time. Alan Turing writes, "all digital computers are in a sense equivalent." The widely accepted Church-Turing thesis holds that any function computable by an effective procedure is computable by a Turing machine. This should follow without controversy from the first three: Programs don't have semantics. Programs have only syntax, and syntax is insufficient for semantics. Every mind has semantics. Therefore programs are not minds. These replies attempt to answer the question: since the man in the room doesn't speak Chinese, where is the "mind" that does? These replies address the key ontological issues of mind vs. body and simulation vs. reality. All of the replies that identify the mind in the room are versions of "the systems reply". The basic "systems reply" argues that it is the "whole system" that understands Chinese. [lower-alpha 17] While the man understands only English, when he is combined with the program, scratch paper, pencils and file cabinets, they form a system that can understand Chinese. "Here, understanding is not being ascribed to the mere individual; rather it is being ascribed to this whole system of which he is a part" Searle explains. The fact that man does not understand Chinese is irrelevant, because it is only the system as a whole that matters. Searle notes that (in this simple version of the reply) the "system" is nothing more than a collection of ordinary physical objects; it grants the power of understanding and consciousness to "the conjunction of that person and bits of paper" without making any effort to explain how this pile of objects has become a conscious, thinking being. Searle argues that no reasonable person should be satisfied with the reply, unless they are "under the grip of an ideology". Searle then responds by simplifying this list of physical objects: he asks what happens if the man memorizes the rules and keeps track of everything in his head? Then the whole system consists of just one object: the man himself. Searle argues that if the man doesn't understand Chinese then the system doesn't understand Chinese either because now "the system" and "the man" both describe exactly the same object. Critics of Searle's response argue that the program has allowed the man to have two minds in one head. More sophisticated versions of the systems reply try to identify more precisely what "the system" is and they differ in exactly how they describe it. According to these replies, the "mind that speaks Chinese" could be such things as: the "software", a "program", a "running program", a simulation of the "neural correlates of consciousness", the "functional system", a "simulated mind", an "emergent property", or "a virtual mind" (Marvin Minsky's version of the systems reply, described below). The theory of computation thus formally explains the open possibility that the second computation in the Chinese Room could entail a human-equivalent semantic understanding of the Chinese inputs. It does not prove that such an understanding exists because the theory does not address the Turing Test. But it does show why the focus belongs on the program's Turing machine rather than on the person's. However, the replies, by themselves, do not prove that strong AI is true, either: they provide no evidence that the system (or the virtual mind) understands Chinese, other than the hypothetical premise that it passes the Turing Test. As Searle writes "the systems reply simply begs the question by insisting that system must understand Chinese." Suppose that the program simulated in fine detail the action of every neuron in the brain of a Chinese speaker. [lower-alpha 26] This strengthens the intuition that there would be no significant difference between the operation of the program and the operation of a live human brain. [I]magine that instead of a monolingual man in a room shuffling symbols we have the man operate an elaborate set of water pipes with valves connecting them. When the man receives the Chinese symbols, he looks up in the program, written in English, which valves he has to turn on and off. Each water connection corresponds to a synapse in the Chinese brain, and the whole system is rigged up so that after doing all the right firings, that is after turning on all the right faucets, the Chinese answers pop out at the output end of the series of pipes. Now where is the understanding in this system? It takes Chinese as input, it simulates the formal structure of the synapses of the Chinese brain, and it gives Chinese as output. But the man certainly doesn't understand Chinese, and neither do the water pipes, and if we are tempted to adopt what I think is the absurd view that somehow the conjunction of man and water pipes understands, remember that in principle the man can internalize the formal structure of the water pipes and do all the "neuron firings" in his imagination. Better technology in the future will allow computers to understand. [lower-alpha 30] Searle agrees that this is possible, but considers this point irrelevant. His argument is that a machine using a program to manipulate formally defined elements can't produce understanding. Searle's argument, if correct, rules out only this particular design. Searle agrees that there may be other designs that would cause a machine to have conscious understanding. In the first case, where features like a robot body or a connectionist architecture are required, Searle claims that strong AI (as he understands it) has been abandoned. [lower-alpha 31] The Chinese room has all the elements of a Turing complete machine, and thus is capable of simulating any digital computation whatsoever. If Searle's room can't pass the Turing test then there is no other digital technology that could pass the Turing test. If Searle's room could pass the Turing test, but still does not have a mind, then the Turing test is not sufficient to determine if the room has a "mind". Either way, it denies one or the other of the positions Searle thinks of as "strong AI", proving his argument. In fact, the room can just as easily be redesigned to weaken our intuitions. Ned Block's "blockhead" argument suggests that the program could, in theory, be rewritten into a simple lookup table of rules of the form "if the user writes S, reply with P and goto X". At least in principle, any program can be rewritten (or "refactored") into this form, even a brain simulation. [lower-alpha 32] In the blockhead scenario, the entire mental state is hidden in the letter X, which represents a memory address—a number associated with the next rule. It is hard to visualize that an instant of one's conscious experience can be captured in a single large number, yet this is exactly what "strong AI" claims. On the other hand, such a lookup table would be ridiculously large (to the point of being physically impossible), and the states could therefore be extremely specific. Searle argues that however the program is written or however the machine is connected to the world, the mind is being simulated by a simple step by step digital machine (or machines). These machines are always just like the man in the room: they understand nothing and don't speak Chinese. They are merely manipulating symbols without knowing what they mean. Searle writes: "I can have any formal program you like, but I still understand nothing." Searle argues that his critics are also relying on intuitions, however his opponents' intuitions have no empirical basis. He writes that, in order to consider the "system reply" as remotely plausible, a person must be "under the grip of an ideology". They system reply only makes sense (to Searle) if one assumes that any "system" can have consciousness, just by virtue of being a system with the right behavior and functional parts. This assumption, he argues, is not tenable given our experience of consciousness. The Chinese room argument is a central concept in Peter Watts' novels Blindsight and (to a lesser extent) Echopraxia. It is also briefly mentioned in the video game Virtue's Last Reward. In Season 4 of the American crime drama Numb3rs there is a brief reference to the Chinese room. 1 2 3 The section consciousness of this article discusses the relationship between the Chinese room argument and consciousness. 1 2 This version is from Searle's Mind, Language and Society and is also quoted in Daniel Dennett's Consciousness Explained. Searle's original formulation was "The appropriately programmed computer really is a mind, in the sense that computers given the right programs can be literally said to understand and have other cognitive states." Strong AI is defined similarly by Stuart Russell and Peter Norvig: "The assertion that machines could possibly act intelligently (or, perhaps better, act as if they were intelligent) is called the 'weak AI' hypothesis by philosophers, and the assertion that machines that do so are actually thinking (as opposed to simulating thinking) is called the 'strong AI' hypothesis." ↑ Searle writes that "according to Strong AI, the correct simulation really is a mind. According to Weak AI, the correct simulation is a model of the mind." He also writes "On the Strong AI view, the appropriately programmed computer does not just simulate having a mind; it literally has a mind." 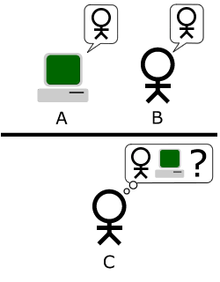 1 2 Searle writes "Partisans of strong AI claim that in this question and answer sequence the machine is not only simulating a human ability but also (1) that the machine can literally be said to understand the story and provide the answers to questions, and (2) that what the machine and its program explains the human ability to understand the story and answer questions about it." ↑ Note that Leibniz' was objecting to a "mechanical" theory of the mind (the philosophical position known as mechanism.) Searle is objecting to an "information processing" view of the mind (the philosophical position known as "computationalism"). Searle accepts mechanism and rejects computationalism. ↑ Harnad edited BBS during the years which saw the introduction and popularisation of the Chinese Room argument. 1 2 Stevan Harnad holds that the Searle's argument is against the thesis that "has since come to be called 'computationalism,' according to which cognition is just computation, hence mental states are just computational states". David Cole agrees that "the argument also has broad implications for functionalist and computational theories of meaning and of mind". ↑ Simon, together with Allen Newell and Cliff Shaw, had just completed the first "AI" program, the Logic Theorist. ↑ Searle believes that "strong AI only makes sense given the dualistic assumption that, where the mind is concerned, the brain doesn't matter." He writes elsewhere, "I thought the whole idea of strong AI was that we don't need to know how the brain works to know how the mind works." This position owes its phrasing to Stevan Harnad. ↑ "One of the points at issue," writes Searle, "is the adequacy of the Turing test." ↑ Computationalism is associated with Jerry Fodor and Hilary Putnam, and is held by Allen Newell, Zenon Pylyshyn and Steven Pinker, among others. ↑ Larry Hauser writes that "biological naturalism is either confused (waffling between identity theory and dualism) or else it just is identity theory or dualism." ↑ The wording of each axiom and conclusion are from Searle's presentation in Scientific American. (A1-3) and (C1) are described as 1,2,3 and 4 in David Cole. ↑ Paul and Patricia Churchland write that the Chinese room thought experiment is intended to "shore up axiom 3". ↑ David Cole combines the second and third categories, as well as the fourth and fifth. ↑ This position is held by Ned Block, Jack Copeland, Daniel Dennett, Jerry Fodor, John Haugeland, Ray Kurzweil, and Georges Rey, among others. ↑ The virtual mind reply is held by Marvin Minsky, Tim Maudlin, David Chalmers and David Cole. The reply was introduced by Marvin Minsky. ↑ David Cole writes "From the intuition that in the CR thought experiment he would not understand Chinese by running a program, Searle infers that there is no understanding created by running a program. Clearly, whether that inference is valid or not turns on a metaphysical question about the identity of persons and minds. If the person understanding is not identical with the room operator, then the inference is unsound." ↑ This position is held by Margaret Boden, Tim Crane, Daniel Dennett, Jerry Fodor, Stevan Harnad, Hans Moravec, and Georges Rey, among others. ↑ David Cole calls this the "externalist" account of meaning. ↑ The derived meaning reply is associated with Daniel Dennett and others. ↑ Searle distinguishes between "intrinsic" intentionality and "derived" intentionality. "Intrinsic" intentionality is the kind that involves "conscious understanding" like you would have in a human mind. Daniel Dennett doesn't agree that there is a distinction. David Cole writes "derived intentionality is all there is, according to Dennett." ↑ Searle also writes "Formal symbols by themselves can never be enough for mental contents, because the symbols, by definition, have no meaning (or interpretation, or semantics) except insofar as someone outside the system gives it to them." ↑ The brain simulation replay has been made by Paul Churchland, Patricia Churchland and Ray Kurzweil. ↑ Early versions of this argument were put forward in 1974 by Lawrence Davis and in 1978 by Ned Block. Block's version used walkie talkies and was called the "Chinese Gym". Paul and Patricia Churchland described this scenario as well. ↑ An early version of the brain replacement scenario was put forward by Clark Glymour in the mid-70s and was touched on by Zenon Pylyshyn in 1980. Hans Moravec presented a vivid version of it, and it is now associated with Ray Kurzweil's version of transhumanism. ↑ The connectionist reply is made by Andy Clark and Ray Kurzweil, as well as Paul and Patricia Churchland. ↑ Searle (2009) uses the name "Wait 'Til Next Year Reply". ↑ Searle writes that the robot reply "tacitly concedes that cognition is not solely a matter of formal symbol manipulation." Stevan Harnad makes the same point, writing: "Now just as it is no refutation (but rather an affirmation) of the CRA to deny that [the Turing test] is a strong enough test, or to deny that a computer could ever pass it, it is merely special pleading to try to save computationalism by stipulating ad hoc (in the face of the CRA) that implementational details do matter after all, and that the computer's is the 'right' kind of implementation, whereas Searle's is the 'wrong' kind." ↑ That is, any program running on a machine with a finite amount memory. ↑ Speed and complexity replies are made by Daniel Dennett, Tim Maudlin, David Chalmers, Steven Pinker, Paul Churchland, Patricia Churchland and others. Daniel Dennett points out the complexity of world knowledge. ↑ Critics of the "phase transition" form of this argument include Stevan Harnad, Tim Maudlin, Daniel Dennett and David Cole. This "phase transition" idea is a version of strong emergentism (what Daniel Dennett derides as "Woo woo West Coast emergence"). Harnad accuses Churchland and Patricia Churchland of espousing strong emergentism. Ray Kurzweil also holds a form of strong emergentism. ↑ The "other minds" reply has been offered by Daniel Dennett, Ray Kurzweil and Hans Moravec, among others. ↑ One of Turing's motivations for devising the Turing test is to avoid precisely the kind of philosophical problems that Searle is interested in. He writes "I do not wish to give the impression that I think there is no mystery ... [but] I do not think these mysteries necessarily need to be solved before we can answer the question with which we are concerned in this paper." Although Turing is discussing consciousness (not the mind or understanding or intentionality), Stuart Russell and Peter Norvig argue that Turing's comments apply the Chinese room. 1 2 Harnad 2001, p. 1. 1 2 3 Searle 1992, p. 44. 1 2 3 4 Russell & Norvig 2003, p. 947. 1 2 3 Searle 1980, p. 11. 1 2 Searle 1980, p. 2. 1 2 Searle 2009, p. 1. ↑ Searle 2004, p. 66. 1 2 Searle 1980, p. 3. 1 2 Harnad 2001, p. 2. ↑ Harnad 2005, p. 1. ↑ Cole 2004, p. 1. ↑ Searle 1999, p. .
↑ Dennett 1991, p. 435. ↑ Searle 1980, p. 1. ↑ Quoted in Russell & Norvig 2003, p. 21. ↑ Quoted in Crevier 1993, p. 46 and Russell & Norvig 2003, p. 17. ↑ Haugeland 1985, p. 2(Italics his). 1 2 3 Searle 1980, p. 13. 1 2 3 Searle 1980, p. 8. 1 2 3 4 Harnad 2001. 1 2 3 4 5 6 7 Searle 1980, p. 6. ↑ Searle 2004, p. 45. ↑ Harnad 2001, p. 3 (Italics his). ↑ Horst 2005, p. 1. ↑ Harnad 2001, pp. 3–5. ↑ Searle 1990, p. 29. 1 2 3 Searle 1990. 1 2 3 Hauser 2006, p. 8. ↑ Searle 1992, chpt. 5. ↑ Chalmers 1996, p. 322. ↑ Hew, Patrick Chisan (September 2016). "Preserving a combat commander's moral agency: The Vincennes Incident as a Chinese Room". Ethics and Information Technology. 18 (3): 227–235. doi:10.1007/s10676-016-9408-y. ↑ Searle 2004, p. 63. ↑ Kurzweil 2005, p. 260. ↑ Newell & Simon 1976, p. 116. ↑ Turing 1950, p. 442. 1 2 Harnad 2001, p. 14. ↑ Searle 1984; Searle 1990. ↑ Hauser 2006, p. 5. ↑ Cole 2004, p. 5. ↑ Churchland & Churchland 1990, p. 34. ↑ Cole 2004, pp. 5–6. ↑ Searle 1980, pp. 5–6; Cole 2004, pp. 6–7; Hauser 2006, pp. 2–3; Russell & Norvig 2003, p. 959, Dennett 1991, p. 439; Fearn 2007, p. 44; Crevier 1993, p. 269. ↑ Cole 2004, p. 6. ↑ Yee 1993, p. 44. ↑ Yee 1993, pp. 42–47. ↑ Cole 2004, pp. 7–9. ↑ Minsky 1980, p. 440. ↑ Cole 2004, p. 7. ↑ Cole 2004, p. 8. ↑ Searle 1980, p. 12. ↑ Fearn 2007, p. 47. ↑ Cole 2004, p. 21. ↑ Searle 1980, p. 7; Cole 2004, pp. 9–11; Hauser 2006, p. 3; Fearn 2007, p. 44. ↑ Cole 2004, p. 9. 1 2 3 Cole 2004, p. 18. 1 2 3 Searle 1980, p. 7. ↑ Hauser 2006, p. 11; Cole 2004, p. 19. ↑ Cole 2004, p. 19. 1 2 3 Dennett 1991, p. 438. ↑ Dreyfus 1979, "The epistemological assumption". ↑ Motzkin & Searle 1989, p. 45. ↑ Searle 1980, pp. 7–8; Cole 2004, pp. 12–13; Hauser 2006, pp. 3–4; Churchland & Churchland 1990. ↑ Cole 2004, p. 12. ↑ Cole 2004, p. 4; Hauser 2006, p. 11. 1 2 Churchland & Churchland 1990. ↑ Russell & Norvig 2003, pp. 956–8; Cole 2004, p. 20; Moravec 1988; Kurzweil 2005, p. 262; Crevier 1993, pp. 271 and 279. ↑ Searle 1992 quoted in Russell & Norvig 2003, p. 957. ↑ Cole 2004, pp. 12 & 17. ↑ Hauser 2006, p. 7. ↑ Searle 1980, pp. 8–9; Hauser 2006, p. 11. ↑ Quoted in Cole 2004, p. 13. 1 2 Dennett 1991, pp. 437–440. ↑ Crevier 1993, p. 269. ↑ Cole 2004, pp. 14–15; Crevier 1993, pp. 269–270; Pinker 1997, p. 95. 1 2 Cole 2004, p. 14. ↑ Churchland & Churchland 1990; Cole 2004, p. 12; Crevier 1993, p. 270; Fearn 2007, pp. 45–46; Pinker 1997, p. 94. ↑ Harnad 2001, p. 7. ↑ Crevier 1993, p. 275. ↑ Searle 1980, p. 10. ↑ Turing 1950, pp. 11–12. ↑ Searle 1980, p. 9; Cole 2004, p. 13; Hauser 2006, pp. 4–5; Nilsson 1984. ↑ Cole 2004, pp. 12–13. ↑ Turing 1950, p. 11. ↑ Turing 1950, p. 12. ↑ Russell & Norvig 2003, pp. 952–953. ↑ Russell & Norvig 2003. ↑ Cole 2004, p. 22; Crevier 1993, p. 271; Harnad 2005, p. 4. Searle, John (1984), Minds, Brains and Science: The 1984 Reith Lectures, Harvard University Press, ISBN 0-674-57631-4 paperback: ISBN 0-674-57633-0. Wolfram Schmied (2004). "Demolishing Searle's Chinese Room". arXiv:cs.AI/0403009 [cs.AI].